What’s better than a delicious vegan soft pretzel!?!? Well, maybe a delicious soft vegan pretzel bun! I mean come on! Who doesn’t want a tasty plant based burger on a homemade pretzel bun? 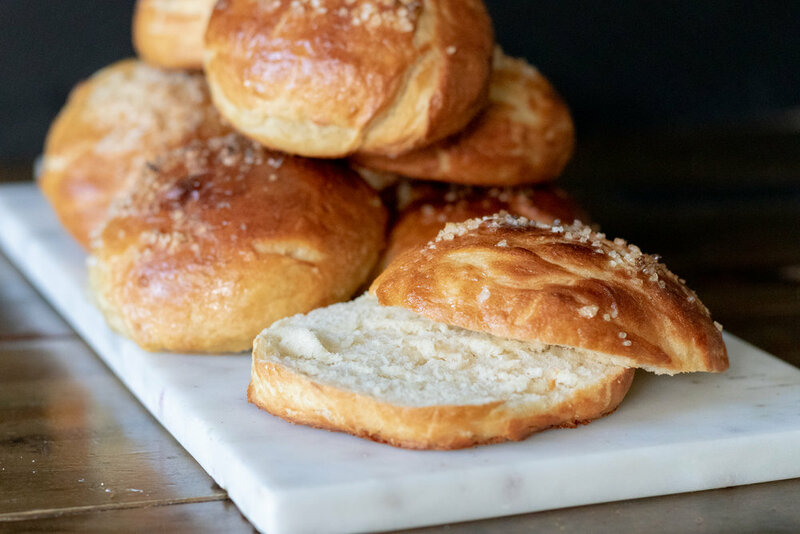 We use our original Challah Y’all, Vegan Challah dough to make these super tasty buns and they are just about perfect. Soft and chewy on the inside, crisp and salty on the outside! Everything a pretzel bun should be, plus they vegan!! 1 cup hot water. I just use hot water from the tap, you don't want it too hot or the yeast will die and it will not activate. Let the that sit for 10 minutes to activate, or until the mixture is super foamy at the top. In a stand mixer add the yeast mixture, aquafaba, sugar, oil, salt, and 2 cups of flour. (you can mix by hand, just mix the above, and add remaining flour slowly. You will need to knead it for the same amount of time. It's a good workout though! Mix until all of the ingredients are incorporated then add in the remaining flour. I typically will hand mix the first 2 cups of flour in, or use my paddle attachment and replace with the dough hook when I add the remaining flour. The dough should come together and not be sticky, if it seems sticky you can add 1/4 more flour a little at at time until the dough comes together. Your goal is smooth, and elastic-y dough, not sticky. Let the dough kneed in the mixer on low/medium speed for 10 minutes. The dough should be smooth at this point and have a sort of bounce back if you poke it. Form dough into a nice ball, and place in a lightly greased glass bowl. Cover the bowl with a damp kitchen towel, and place inside your oven turned off, OR on the bread proof setting if your oven has one. Bring a small pot of water to a boil and place in the bottom of the oven. The heat and steam from the water will help the dough to rise. Let dough rise about an hour, or until the dough has doubled in size. Remove dough from oven, and on a clean lightly floured work surface, divide the dough into 10 equal pieces and form them into round bun shapes. Place them on a parchment lined baking sheet to rest. Bring a large pot of water to a boil. I use my dutch oven. Once it is boiling add 2 teaspoons baking soda. Gently put 1 to 2 buns into the boiling water at a time. After 30 seconds carefully flip the buns over suing a slotted spoon and let them boil for another 30 seconds. Remove from the water and place back on parchment lined baking sheet. Repeat with remaining buns. Mix reserved cup of aquafaba with 1 tablespoon of maple syrup, and brush bun tops with the mixture. Sprinkle buns with course salt. Place buns in the oven on the middle rack and bake for 20-25 minutes. You can brush them a few times with the aquafaba mixture during the baking process to help make them shiny and to darken up. Allow buns to cool before slicing and serving. I love to smell fresh bread baking. Carbs are my weakness. I actually have a necklace that I wear often that says “carbs” with a heart engraved on it. So you can see my love for bread and all things carbs runs deep. I really, really love a nice big delicious sandwich on fresh baked bread! If you have never made loaf bread, let me tell you, you are missing out. 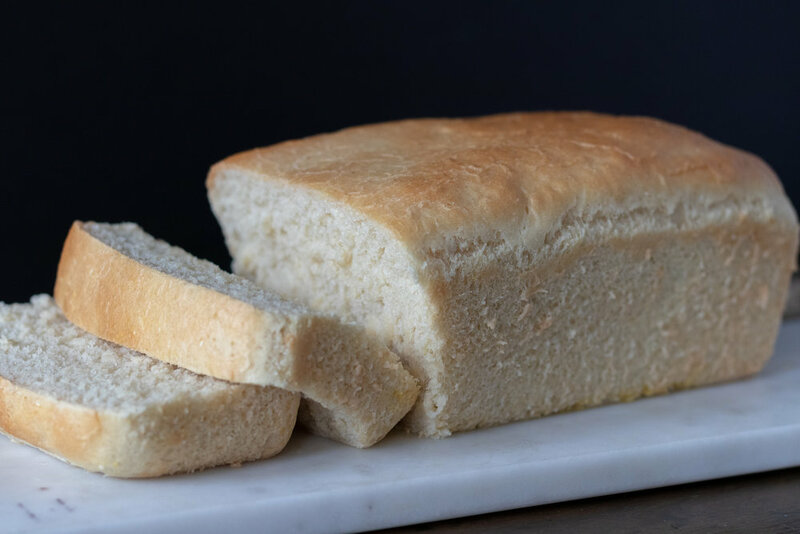 You do not need a fancy bread machine to make easy and fresh baked bread either! Just a loaf pan and an oven. I am always amazed at just how many ingredients are in store bought bread, half of which I do not know what they are ,or how to pronounce. So I end up paying $5 or more for a loaf of vegan organic, healthier bread, which will be gone after my family of 6 make a sandwich. Homemade vegan bread is far cheaper, and much healthier than most store bought options, and its easy to make! You can easily double this recipe as well, and bake up two loaves at once if you are like us and have a lot of mouths to feed. It also freezes well so you could bake up 2 loaves,and just freeze one for later!!! So to all you other carb lovers out there, may your bread always be fresh, fluffy, and make you super happy!! In a microwave safe container, heat the milk and water to around 110 degrees, You can use a thermometer to test the temp, but if you do not have one, the liquid should feel a little hotter than hot tap water. You do not want the liquid too hot (not boiling) because It will kill the yeast. Add the hot milk, along with the yeast and the sugar to a large glass bowl. Let the mixture sit for about 10 minutes to activate the yeast. It should get foamy on top. If nothing seems to happen with the yeast, and it does not get foamy on the top, then you may have gotten the milk too hot and killed the yeast. Add the yeast and milk mixture, along with the remaining ingredients to a stand mixer. I often stir using a wooden spoon just to incorporate the ingredients before attaching the dough hook. Mix on medium speed for about 2 minutes,. If the dough seems too sticky and is sticking to the bottom of the bowl, add a few more tablespoons of flour. The dough will be very soft though. If you do not have a stand mixer, add the ingredients to a large bowl and mix by hand. Turn dough over onto a clean, floured surface, and knead for 2 to 3 minutes. Lightly grease an 8 1/2 by 4 1/2 loaf pan and sprinkle the bottom with a little corn meal. Press the dough evenly inside the pan and cover with plastic wrap. Let dough sit in a warm place for about an hour to rise. The dough should rise almost to the top of the pan. Preheat oven to 400 degrees. Bake bread for about 25 minutes. Allow the bread to cool in the pan on a wire cooling rack for about 10 minutes before turning it out onto the rack to continue cooling. I normally run a sharp knife around the edge of the pan to help release the bread. This bread works well for sandwiches. We also like to slice it thick and heat it with vegan butter in an iron skillet to use as Texas Toast. Warm, chewy on the outside, soft on the inside, fresh, homemade bagels! Yes, Yes, and YES! Seriously, y'all, fresh homemade bagels are so easy to make, plus you get to top them with whatever you want! Bagels freeze really well, so make yourself a double batch on the weekend, and next week’s breakfast just got a lot easier, and a whole lot more tasty! If you don’t believe me, I have left photo proof of our two year old digging into a fresh everything bagel that she slyly snatched as we were trying to photograph them. I mean she just did the thing the rest of us wanted to do. But who can blame her. They are that good! And if y’all can’t do gluten, don’t worry! Our friends over at Not That Kind of Vegan took this recipe and turned it gluten free, so go check out their recipe !! Now everyone can have their bagel and eat it too!! optional toppings: everything bagel seasoning, sesame seeds, salt, poppy seeds, shredded cheese, or anything else you can think of! In a large bowl add water, yeast, and 1 teaspoon of sugar. You want the water warm but not too hot. Tt needs to be around 100 degrees. Much hotter and it will kill the yeast. I just use hot water from the tap. Let the mixture sit for about 10 minutes until it is nice and foamy. Add the yeast mixture along with the remaining ingredients to a stand mixer. You can either use the paddle attachment to get everything mixed up, or mix it by hand before attaching the dough hook. Allow the dough to knead on medium speed for about 10 minutes. It needs to knead for this long! I promise. If you do not have a stand mixer then you can mix the ingredients by hand and knead for about 15 minutes. Baking and a workout at the same time! Heck yes! Look at you burning those bagel calories before you even eat one! Pull off a piece of dough and stretch it. You want it to make a “windowpane” that you can see through, but does not rip. That’s when you are done kneading! Place dough in large bowl and cover with plastic wrap or a damp kitchen towel. Allow dough to rise for about an hour. It will grow but not quite double in size. Once dough has risen, divide into 8 equal pieces. Form a ball with each piece and poke a hole in the middle using your finger. Stretch the ring of dough out a bit and place on a parchment lined baking sheet. Bring a large pot of water to a boil. Once boiling, add 2 teaspoons of baking soda. Add 1 or 2 bagels at a time and allow to boil on each side for about 45 seconds. Remove the bagel from the water and place back on the parchment lined baking sheet. Sprinkle bagel with desired toppings while the bagel are still wet and the toppings will stick. Bake bagels for 25 - 30 minutes. You can brush the bagels with a 1/2 cup whipped aquafaba mixed with 2 tablespoons of maple syrup, or melted vegan butter. This just helps the bagels brown. You do not have to brush them with anything. Allow bagels to cool on a the baking pan before storing in an airtight container at room temperature. You can freeze the bagels for up to a few months. You can also split the dough into 16 pieces if you want smaller bagels. If you have not noticed my affection for challah bread by now, then let me reiterate that I LOVE challah, LOVE IT!!! I used to bake and sell challah each week actually, until I started this site and life got too busy. I have t-shirts expressing my challah love. Challah at ya! Challah y’all! Challah day, celebrate! I ain’t no challah back girl. I could go on and on with my challah puns. I love it start to finish, dough to bread. I love the act of preparing challah on shabbat, and I love finding new ways to stuff it so it becomes a total meal. Challah takes some time to make, but it is 1,000% worth it! This vegan challah was the request of our 13 year old daughter. She loves our Buffalo “chicken” dip with jackfruit and stuffing that magic into warm, soft, fluffy challah seemed like a no brainer to me! Covered in melted vegan cheddar and drizzled with hot sauce glaze, its now on my top 5 favorite stuffed challah list! So bake up a batch of our Vegan Buffalo “chicken” dip and stuff your own vegan challah. Then challah at me and let me know how much you loved it! Follow the recipe for my basic Challah Y'all, Vegan Challah. You will follow the instructions through the first rise, then follow the below instructions for stuffing and braiding. Once Challah has completed its first rise, remove from oven and separate dough in half. This recipe will yield 2 stuffed challah loaves. Take one piece of dough in your hand and begin to stretch it both length wise, and width wise and the same, time, letting gravity help with the length. You want a rectangle of dough that is about 5 inches wide and about 6-7 inches long. Once your dough is the correct size, Add a few scoops of dip to the center of the dough. Do not get too close to the edges, if the dip wets the dough it will not seal together. Once stuffed, bring the outside edges together, and pinch to seal. Once dough is sealed, pick it up and start to gently stretch the dough into a fat rope. You will have to kind of squeeze and pull at the same time, just do not squeeze so hard that the filling comes out. You just need the rope long enough to braid, 10-12 inches. Repeat with the other two strands. Once all three strands are stuffed, and formed, carefully braid the three pieces together. If the seams begin to open, pinch them back and continue braiding. Tuck both ends of the loaf under when done braiding. Once again I will refer you to Tori Avey's challah braiding guide if you are unfamiliar with braiding challah! She does a fantastic job showing all the different ways to braid your bread, plus she has some really great recipes on her site. Repeat with the second loaf, and place both stuffed loaves on a baking sheet, and back in the oven to rise again for about 45 mintues. Once they have risen, remove from oven and pre-heat to 350. Mix 1 cup of left over aquafaba, maple syrup and buffalo sauce. Brush each loaf of challah with the mixture and sprinkle with vegan cheddar shreds. You can also add a little extra hot sauce to the aquafaba mix and drizzle it over the challah before you bake it. Bake both loaves for about 35 - 45 minutes. You can tap the tops to see if they sound a little hallow. It is hard to tell when stuffed challahs are done when there are wet ingredients inside, so if they do not seem cooked through after 35 minutes, let them keep cooking for 5 - 10 more minutes. Remove challah from the oven, and allow to cool some before cutting. *Follow us on Instagram @86.eats and check out step by step challah making in our highlights. This shows making aquafaba, and the stages of the dough! I love the smell of fresh bread baking, so tend to bake bread often. This bread in particular is so simple and yields 3 nice big loaves. I like to bake some up on the weekend and have fresh bread throughout the week. You can also easily freeze the loaves you don’t use for later. Feel free to add herbs or spices to the dough if you feel like jazzing up your bread with some extra flavor. If you are new to bread baking, this recipes is so simple, so don’t be afraid to give it at try. Once you start baking your own bread, there is no turning back! In the bowl of your stand mixer, or if mixing by hand, in a large mixing bowl, combine yeast, warm water, salt and flour. There is no need to allow the yeast to proof. If using a stand mixer, attach the dough hook and mix the dough for a few minutes. You do not have to allow it to knead for long. It will be a little stickier that other bread doughs you may have made. You may have to sprinkle the dough with a little extra flour to pull it out of the bowl. If mixing by hand, stir with a wooden spoon or your hands until the ingredients are well combined, then turn the dough out onto a clean, floured surface. Knead dough by hand for a few minutes. Once the dough has doubled in size, divided it into three equal pieces. The dough will be sticky so you will need to dust it, and your hands in extra flour to be able to handle it. Holdng a portion of dough in your hands, form a ball while rotating the dough, pulling and tucking the dough to the underside of the ball to stretch the dough on top. The top should be smooth and even, while the underside will not be so pretty. It does not have to be perfect, you are just trying to make a nice smooth ball out of the dough. Dust more flour on the top, and using a sharp knife make three slashes across the top of the dough. The flour will make it easier to cut through the sticky dough. Place the finished ball on a piece of parchment paper on top of a cutting board. Repeat with the other 2 portions of dough. Preheat your oven to 450 degrees with one rack in the center of the oven, and one rack at the bottom. Place a few baking sheets, or baking stones in the oven as it heats. You need to be able to fit the three loaves on whatever pans you choose, so keep that in mind. On the bottom rack place a shallow baking pan or jelly roll pan. It just needs to be deep enough to hold 1 cup of water. Once the oven is done heating, carefuly slide the dough and parchment paper off of the cutting board, onto the heated pans. Then carefully add 1 cup of water to the pan you placed on the bottom rack of the oven. Quickly close the oven. The steam from the water will help crisp the bread. Let the bread bake for about 30 minutes. Once it is browning on top, and sounds hollow when you tap the top, it’s done. Allow the loaves to cool. You can freeze a loaf or 2 in large freezer bags if not using right away. I have been baking and stuffing challah bread for what seems like forever. This spiced apple and pecan stuffing has long been a favorite for fall, and the high holidays. This vegan challah bread is just as beautiful as it is delicious, and is sure to impress anyone who gets the privilege of tasting it. If you have never made challah, then by all means, you must! It’s not nearly as intimidating as it may seem, and the stuffing possibilities are endless! Peel apples and finely dice them. You want pretty small pieces so they will fit in the challah braids, and cook through while baking. Next, chop pecans, and dates. Add fruit and nuts along with remaining filling ingredients into a bowl, and stir well. Take one piece of dough in you hand and begin to stretch it both length wise, and width wise and the same, time, letting gravity help with the length. You want the dough to be about 12 inches long, and maybe 4 inches wide. Once you have it stretched length wise, you can put it on a floured counter top and press it to get it the width stretched. Once your dough is the correct size, divide the apple filling in half. Then each half into thirds. This will give you 6 equal portions of filling for each strand of dough. Scoop a portion of filling into a row down the middle of a strand of dough. The filling will produce a liquid from the apples at the bottom of the bowl. Avoid scooping up any of this liquid with the filling. If the dough is wet it will not want to stick and seal. Now pull up the edges of the dough and pinch them together to seal the seam. Once all three strands are stuffed, and formed, carefully braid the three pieces together. If the seams begin to open, add a little flour to them and pinch them back and continue braiding. Tuck both ends of the loaf under when done braiding. Once again I will refer you to Tori Avey's challah braiding guide if you are unfamiliar with braiding challah! She does a fantastic job showing all the different ways to braid your bread, plus she has some really great recipes on her site. Repeat with the second loaf, and place both stuffed loaves on a baking sheet, and back in the oven to rise again for about 45 minutes. Once they have risen, remove from oven and pre-heat to 350. Brush tops of challah with some of your left over whipped aquafaba and sprinkle with a little sugar. Remove challah from the oven, and allow to cool before cutting. Nothing goes better with a hot bowl of soup, chili, or beans than some homemade cornbread. My mom has always used mayo in her cornbread in place of eggs, so swapping out for vegan mayo was an easy fix. Using oat milk will help you get a darker color in vegan baked goods, but use whatever plant based milk you have on hand. You can easily bake these up in a muffin tin as well, if you prefer corn muffins to regular cornbread. Mix together dry ingredient in a large bowl. Next, add in wet ingredients and mix well. Lightly oil a small cast-iron skillet or baking pan before adding the batter. If using a cast iron skillet, place it in the oven as it preheats. Pouring the batter into a hot pan will help it form a nice crispy edge. Let cornbread bake for 20-25 minutes or until a toothpick poked in the middle comes out clean. 1/3 cup neutral oil. I use refined coconut. In a glass bowl, add yeast, water, and 1 tablespoon of sugar. Let sit for 10 minutes until the yeast becomes foamy. If using a stand mixer, add flour, salt, and remaining sugar to the mixer bowl. Once yeast is ready, mix in flax egg, and oil to the the yeast mixture. Add the wet ingredients to the dry ingredients. Mix on medium speed for 5 minutes. If the mixture is too dry, you can add a tablespoon more of water. If it seems too wet add a tablespoon more flour. The dough should be soft but not sticking to the sides of the mixer. If mixing by hand, follow above instructions for combining ingredients. Once the dough is mixed, pour out on a clean counter top. and kneed by hand for 5 minutes. Once dough is ready, divide into 9 equal pieces. If you want smaller buns, divide into 12 equal pieces. Form a disk shape with each piece of dough, but do not flatten them out. Place on a parchment lined cookie sheet. Allow buns to rest for 10 minutes while you pre heat the oven to 425 degrees. Once the oven is ready, place buns inside and bake for 10 - 15 minutes. If the buns are not browning evenly, you can rotate the baking sheet halfway through baking. You can also brush them with some vegan butter to help them brown. Once buns are finished baking, allow to cool before serving. In a large glass bowl mix hot water, yeast, and 1 tablespoon sugar. Mix until all of the ingredients are incorporated, then add in the remaining flour. I typically will hand mix the first 2 cups of flour in, or use my paddle attachment and replace with the dough hook when I add the remaining flour. Remove dough from bowl and split in half. Next, evenly divide each half into 8 equal pieces. Rolling the dough pieces between both hands, form ropes that are about 12 inches long with each piece of dough. Allow pretzels to rest for about 15 mintues. While this is happening bring a large pot of water to a boil. Preheat oven to 400 degrees. Once pretzels are done resting, add 2 tablespoons of baking soda to the water. Add pretzels 2-3 at a time into the water for about 30 seconds. You will need to flip them half way through. Just use a slotted spoon and gently turn them over in the water. Return them to a parchment lined cookie sheet once they come out of the water. Brush pretzels with leftover aquafaba, and sprinkle with some corse sea salt before putting in the oven. Bake pretzels for 15- 20 minutes. I normally move my top rack to the highest position for this. That way they get nice a brown. You will need to keep a close eye on them, and if they brown really quickly, move them to a lower rack for the remainder of the bake time. Once done allow to cool on pan while you prepare the cheese sauce. Place cashews in microwave safe container and cover with water. Microwave for 3 minutes. Drain water from cashews, then add all ingredients to a high speed blender or food processor. Pour mixture into a pot, and cook on medium heat, stirring the WHOLE time with a whisk. As soon as the cheese starts to thicken remove from heat. If it gets to thick, add a little more water and it will thin back out. Cheese sauce will last about a week in the fridge, pretzels can be stored in airtight container at room temperature. The only thing better than vegan challah, may be stuffed vegan challah! And the only thing better than a meatball sub, may be a whole loaf of soft, delicious bread ,stuffed with cheesy, saucy, meatballs. But don't take my word for it! Bake up a loaf and taste for yourself! Mix thawed burgers, panko bread crumbs, garlic, spices, and flax egg together in a bowl. Once well combined, form meatballs with a small scoop, or spoon, and place them on a baking pan. You can line the pan with parchment paper for easier clean up. Sauté onions and carrots in 1 teaspoon of oil until onions are translucent with 1 teaspoon of salt in a large pot for 5 minutes. Add the wine, and let it cook for 2 minutes. Add the remaining ingredients, and let the sauce simmer for 30 minutes. Add the cooked meatballs, and let simmer in the sauce for 15 minutes. Once your dough is the correct size, begin adding the meatballs in a row, it works best if you cut them in half. You can add a LITTLE sauce, but if the dough becomes wet on the edges, it WILL NOT seal together when pinched. So do not over fill. Sprinkle with vegan cheese shreds. Save the extra sauce for dipping, later. Once stuffed, bring the outside edges together, and pinch to seal. Brush tops of challah with some vegan butter. Remove challah from the oven, and allow to cool some before cutting. Serve with reserved sauce for dipping. Remove dough from oven, and on a clean lightly floured work surface, divide the dough in half, and braid each loaf. Tori Avey has a wonderful guide on challah braiding that you can check out, or follow the pictures below for a 4 strand braid. Place both challah loaves on a cookie sheet, and cover with a damp towel. You may need two cookie sheets. You don't want the loaves touching or they will stick together as they bake. Place challah back in the oven and allow the loaves to rise again for about an hour. Once loaves have risen, remove from oven, and preheat oven to 350 degrees. You can either brush the loaves with vegan butter, or you can make an aquafaba wash with 3 tablespoons of the left over aquafaba, and a splash of maple syrup. This will help the loaves to brown. Which ever method you choose, brush the loaves before placing them in the oven, and brush a few more times throughout baking. Loaves will need to bake around 20 - 30 minutes, depending on the oven. Keep an eye on them and once they begin to brown all over, give them a tap with your finger. If they sound hallow, they are done! Let Challah cool on a wire cooling rack before serving. Separate your dough into 4 equal pieces and begin forming "ropes" with them. Let gravity help with this. The dough will stretch out as you work on lengthening the ropes. Now repeat starting at the far right again, always going over, under, over. ALWAYS start right. ALWAYS over, under, over. When you are done tuck, the ends of the braid under the loaf. Just a heads up, this bread will make THE BEST french toast you have ever made! Challah y'all! Add 3 cups of flour, baking powder and salt to bowl and mix with a whisk, making sure it is mixed well. Add the butter using your hands to mix it into the dry ingredients, using your fingers to break up the butter until the mixture becomes crumbly. Pour vinager into the milk and let it sit for a few minutes. Now add milk into the mixture, again using your hands, mix the milk in. THIS IS IMPORTANT: do NOT over mix. You want everything combined, but stop once you get to the point that the dough can be handled. It will likely still be sticky, but the less you mix it, the fluffier the biscuits! Sprinkle some of the remaining 1/2 cup of flour onto a clean work surface. Sprinkle enough flour over your dough to be able to handle it. Gently pat the dough out on your floured surface until it's about an inch or so thick. Using a biscuit cutter or glass , cut circles out of the dough, patting down the scraps until all of the dough is used. Place biscuits together on a backing sheet. It helps them to rise if they are touching. Bake biscuits for 10-15 minutes. Once they begin to brown on top check them by pulling one away to see if they are baked through. These are perfect topped with Chicken Fried Seitan, vegan butter, jam, jelly, or tofu scramble.